On February 5th, 2019, Ijevan Branch of “Yerevan State University” Foundation hosted a training course on “Life Skills”, implemented by IAB International academy of Business, within the framework of Coca-Cola Hellenic Bottling Company’s “Youth Empowered” three-year program. 20 young people from Tavush region took part in the training. The training was conducted by Hakob Makdis, a trainer at IAB International academy of Business and Slavik Alaverdyan, lecturer of YSUIB Department of General Mathematics and Natural Sciences. Alaverdyan presented “Youth Empowered” program and then started the “Self-awareness and Self-Development” modules. Hakob Makdis conducted the “Creating and Strengthening Professional Ties” module, focusing specifically on body language. 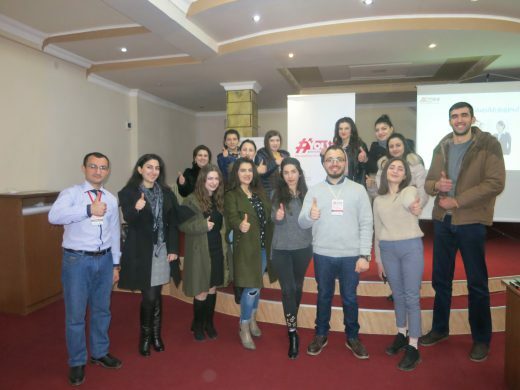 “Communication Skills”, “Job Search and Applying Skills” modules were implemented by the trainers jointly with the support of mentors Anush Saribekyan, Arpine Yeganyan, Alex Nersisyan, Zhanna Kocharyan and Arpi Tamrazyan. With the help of experienced mentors, program participants acquire self-development and self-assessment skills, including online and offline networking, receiving and giving feedback, writing a cover letter and a CV and others. The next training on “Life and Business Skills” will be held in spring. If you want to take part in the upcoming trainings, do not hesitate to register via the following link.